The instructions for mixing pigments are fairly easy but this is where a good part of the expertise of Nihonga rests...mixing the right amount of glue to water to pigment ratio for the layer you are painting takes time and experience to master. So be patient with yourself. You want the glue strong enough so it sticks to the paper but not too strong or it may crack later or make it hard for additional layers to stick. You want to use a stronger glue mixture on the first layers and progressively less glue on the top layers. You can sometimes correct it if you find the pigment brushing off the paper once dry...indicating too weak a glue mixture...by spraying a light mixture of dhosa over the top and letting dry. Take some glue and pigment and mix in bowl with middle finger (i.e. with firmness, you're pushing air bubbles out so glue connects with pigment. You may want to add a little distilled water to glue but not too much as this point so as not to over dilute the glue. A fine whitish watery film may rise to the top as you mix, these are impurities, drain this off the top. For ochre (odo) and many earth pigments, this may be all you have to do before you start to paint. Let mixture sit and dry out...usually overnight. This allows the glue to saturate the pigment. When its completely dry it will feel solid and hard. Add water to loosen and reconstitute the paint and bring it to the consistency you want for painting. (Mako sometimes does this process of letting the glue dry out and then reconstitute 2-3 times to really get the pigment saturated with glue). You can now add as much water as you want to the mixture and the pigment will still stick to the paper because the glue has thoroughly saturated the pigment. You can let the pigment and glue dry out each night if you want and reconstitute it the next day. However if you let the glue and pigment sit too long (a few weeks) it will temper to a hard state and you can't reconstitute. Cleaning Glue Out of Pigment: If you are going to leave the pigment for more than 4-6 weeks, you may want to clean the glue out of the pigment, returning the pigment to a powder state. 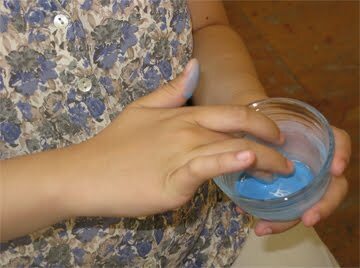 Do this by adding water, mixing and letting the glue sit a few minutes so the pigment settles to the bottom. Pour out the top water, leaving the pigment. Do this a couple of times. Then add more water and heat the mixture up. Heat will release the glue from the pigment and it will rise to the top. Then pour out the top and let dry. When dry the pigment should be powdery. If it isn't, add water and heat again and do this until its powdery when dry. This will save your valuable pigments so you won't have to throw them away in hardened glue. Thank you for these notes and the videos. I know it's been some years since this workshop, but I'm wondering if you can clarify. Above you note that "Mako sometimes does this process of letting the glue dry out and then reconstitute 2-3 times to really get the pigment saturated with glue." I'm wondering, when doing this 2-3 times like Mako says he sometimes does, is he reconstituting each time with glue or with water? It seems that reconstituting with water (when you plan to do this 2-3 times) would dilute the glue and that it would be better to reconstitute with glue? I could not tell from your notes what he uses. Do you remember? It seems to me that Mako is answering your question at the end of the video. He says he uses glue for reconstituting after the mixture has been sitting for a while. When I do this, I allow the mixture to totally dry out so all the water has evaporated out and just glue and pigment are left. Then I reconstitute by adding water and a little heat. This helps the glue to adhere to the pigment better and allows you to add as much water as you want to do delicate washes. The pigment will still stick to the paper. However, you might also feel you need some more glue. It depends on how many layers of paint you have on already, on the humidity in the air, on some mystical sense of oneness you have developed with the paint…smile…I don’t really know how to describe it. The more you paint the more you will get a sense about the glue. This is a big part of the art of Nihonga.